Prime Minister Narendra Modi has said he is dedicated to the welfare of Dalits, and added that "those self-appointed guardians" who see this as an obstruction to their politics were creating hurdles and tension in the country. 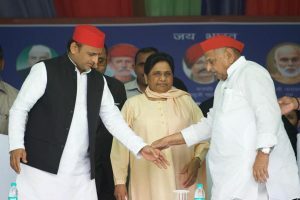 "All those self-appointed guardians who were trying to create tension in the country did not like that Modi is with the Dalits… That Modi devotes himself to tribals. I am devoted to the welfare of all Dalits, oppressed, underprivileged and deprived," the Prime Minister said in an interview to CNN News 18 news channel. "Those who see this as an obstruction to their politics are the ones creating trouble. And this is why they are levelling baseless allegations," the Prime Minister said. Modi also said that "political tones" were being given to social problems. "All those who have fed this country the poison of caste divide have destroyed this country. They must stop giving political tones to social problems. We must go forward with a purpose," he said. Prime Minister Modi and the Bharatiya Janata Party (BJP) led government in the Centre have been targeted by opposition parties over the attack on Dalits by cow vigilantes in Gujarat in the name of cow protection.